An original Apple 1 computer is up for auction at Christie's until July 9. Apple fans are serious. They will line up for hours to buy the newest version of the iPhone and they'll pay a lot for a 37-year-old computer. One of the few remaining original Apple I computers was put up for bids Monday, and auction house Christie's expects it to attract a winning bid of between $300,000 and $500,000. Half a million dollars is a lot for a circuit board built in 1976 without casing, keyboard or monitor. In fact, that kind of money could buy you 250 MacBook Pros. But, the Apple I isn't just any circuit board. It was the first product designed by Apple (AAPL) co-founder Steve Wozniak who built it in his partner Steve Jobs' parents' garage. 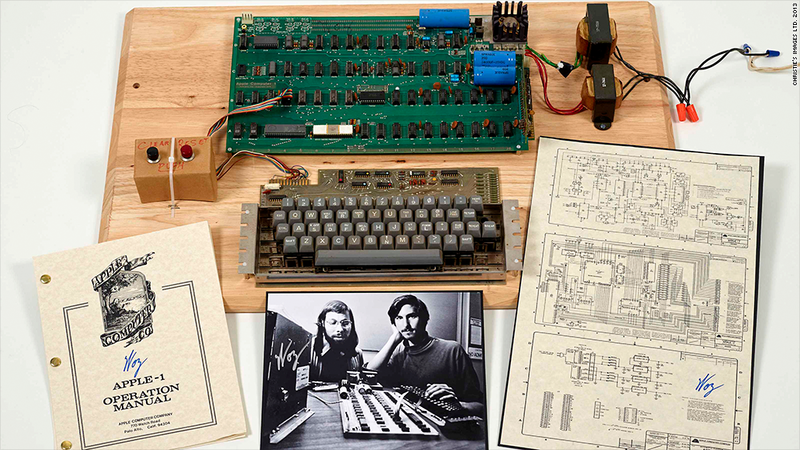 Only about 200 Apple 1 computers were ever built by Wozniak and Jobs. At the time, the design attracted the attention of Paul Terrell who owned a Silicon Valley store chain call Byte Shop. He bought the first 50 Apple I computers for $500 each and resold them for $666.66. In May, an Apple I computer sold for $671,000 at a German auction house, Auction Team Breker. Last year, one sold for $374,500 at a Sotheby's auction. Bidders have until July 9 to make an online bid at Christie's for the latest Apple I to go on sale. Other iconic computers from the 20th century, including a 1983 Apple Lisa computer, and a prototype of the first Macintosh laptop, are also included in the auction.